Blend, mix and whip up your favorites in style with the KitchenAid Artisan stand mixer. Tilt-up head provides easy access to bowl/beaters. Ergonomic handle ensures a comfortable grip. Unique extended-reach mixing action adds versatility. Speed control lever offers ten mixing speeds. Two-piece pouring shield prevents ingredient splash-out. Built-in power hub lets you attach accessories. 14"H x 8 3/4"W x 14 1/8D. 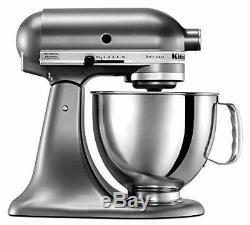 The item "New KitchenAid Artisan Series 5 Quart Stand Mixer KSM150PSQG Liquid Graphite" is in sale since Friday, December 1, 2017. This item is in the category "Home & Garden\Kitchen, Dining & Bar\Small Kitchen Appliances\Countertop Mixers". The seller is "gwol9874" and is located in Framingham, Massachusetts. This item can be shipped to United States, Canada, United Kingdom, Denmark, Romania, Slovakia, Bulgaria, Czech republic, Finland, Hungary, Latvia, Lithuania, Malta, Estonia, Australia, Greece, Portugal, Cyprus, Slovenia, Japan, China, Sweden, South Korea, Indonesia, Taiwan, South africa, Thailand, Belgium, France, Hong Kong, Ireland, Netherlands, Poland, Spain, Italy, Germany, Austria, Israel, Mexico, New Zealand, Philippines, Singapore, Switzerland, Norway, Saudi arabia, Ukraine, United arab emirates, Qatar, Kuwait, Bahrain, Croatia, Malaysia, Brazil, Chile, Colombia, Costa rica, Panama, Trinidad and tobago, Guatemala, Honduras, Jamaica, Bahamas, Viet nam, Uruguay, Antigua and barbuda, Aruba, Belize, Dominica, Grenada, Saint kitts and nevis, Saint lucia, Barbados, Bermuda, Brunei darussalam, Bolivia, Ecuador, Egypt, Guadeloupe, Iceland, Jordan, Cambodia, Cayman islands, Sri lanka, Luxembourg, Maldives, Nicaragua, Oman, Peru, Pakistan, Paraguay.